Dozens of residents at the Atlantic Palms condominium complex could be evicted from their homes within two weeks if they're unable to pay a city utility bill of more than $7,000. 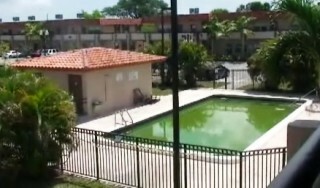 Margate officials say more than 60 of the 76 units at Atlantic Palms, at 400 NW 65th Ave., are in different stages of foreclosure, and their homeowners association can't afford to pay the water bill. Now, the city has posted notices on residents' doors saying they have until 6 p.m. June 3 to pay their water and sewer fees. If residents don't pay, their water service will be shut off June 7, and they will be forced to leave because of health concerns. "I'm going to lose my home. I'm trying to do a [loan] modification to save my home," said Etienne Rodriguez, 37, a three-year resident whose condo is in foreclosure proceedings after he was laid off from his sprinkler installation job. "I think the city should give these people an opportunity if we can come up with the money." Jerome Tepps, a Plantation-based lawyer representing Atlantic Palms, said their financial struggle is common among homeowners associations across South Florida. "This illustrates the difficulties that associations are having," Tepps said. "Many people are having a hard time. I'm hoping they can raise the money. Or else, they're going to be required to leave. It can become a ghost town." facing serious problems because of delinquencies caused by foreclosures and owners who stopped paying. Margate City Manager Frank Porcella said it's been almost a year since the city began trying to help Atlantic Palms' residents with their debt. "Obviously, we don't want it to come to that [evictions]," Porcella said. "Our track record has shown that we've been working with them since July. We certainly don't want to put them out on the street. But we need to resolve this issue." The latest water and sewer bill has been lowered from about $10,000 "to soften the blow," Porcella said. But it would be unfair to other utility customers if the city waived all of Atlantic Palms' bills, he said. The city has agreed to pay garbage bills in exchange for property liens, he said. The city also previously cleaned the community pool, which on Tuesday was cordoned off because its water was dirty. The complex's four buildings each have one water meter, so each building has its own water bill. Building A owes $1,102; Building B, $1,216; Building C, $3,139; and Building D, $1,777. 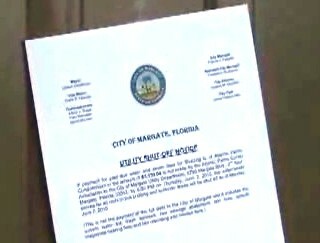 Residents in the buildings that pay their bills will be allowed to stay. Some residents said they are trying to rally neighbors to pay the debt but are unsure if they'll succeed. "I'm panicking," said Raynande Moise, 42, a mother of two who recently had open heart surgery. "We can't afford to move." Milord Pierre Fils, 42, has shared a condo with his cousin for two years. Asked where he would go if he was evicted, he replied: "I don't know yet."